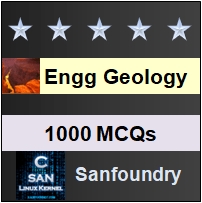 This set of Engineering Geology Multiple Choice Questions & Answers (MCQs) focuses on “The Mantle, The Core”. Explanation: The second layer, Mantle, lies beneath the crust and this zone starting from the lower boundary of the crust continues up to a depth of 2,900 km. Explanation: The upper mantle is further divided into two layers of 400 and 600 km thickness respectively. 3. The exact nature of the mantle is completely understood. State true or false. Explanation: It is said that the exact nature of the mantle is as yet incompletely understood. 4. Which of the following is not true about Asthenosphere? Explanation: It is in solid state is not true and the remaining options are true and they are characteristics of the asthenosphere. In Greek, “asthenes” means without strength and hence the name. 5.	Who was the first person to tell about the Core? Explanation: The existence of the core was suggested by R.D. Oldham in 1906 and subsequently confirmed by other seismologists. Explanation: The mantle extends up to the depth of 2900 km and from that depth it is the core that is said to be present and the radius of the Earth is 6371 km and hence the core is said to extend till 6371 km. 7. Which of the following is true about the inner core? d)	It is believed to be a gaseous body. Explanation: The inner core with a thickness of around 1790 km is believed to be a solid body. Explanation: At the base of the mantle, density is inferred as 5.7 g/cc that jumps to 9.9 g/cc at the top of the core. Explanation: The outer core behaves more like a liquid because the S-waves from the earthquake shocks reaching this zone are not transmitted through this zone at all. 10. There is a hypothesis that the inner core is made up chiefly of iron and nickel. State true or false. Explanation: As regards the chemical composition of the inner core, the hypothesis that it is made up chiefly of iron and nickel elements has found support from many accounts. Explanation: The value of density reaches 12.7 g/cc at the boundary of the inner core and becomes 13 g/cc at the centre of the Earth. Explanation: The Asthenosphere is believed to be located entirely in the upper mantle and supports the slowly moving tectonic plates. 13. What is the thickness of the inner core? Explanation: The inner core, is believed to be in solid metallic state and is said have thickness of about 1790 km. Explanation: The asthenosphere is believed to be the source of much volcanic activity and many other processes. It is is said be to located completely in the upper mantle.